Benefits of marigold flower-Uses of Calendula oil for acne,skin..
Marigold has always been used from time immemorial in the treatment of headaches, toothache, and swelling and also for strengthening of the heart. This lovely flower has been used in several culinary recipes like soups and stews and hence it has derived its name ‘pot marigold’ from this tradition of adding this beautiful flower to the cooking pot. During the First World War and also during the time of the American Civil War, Calendula or marigold was used widely to treat wounds and prevent them from getting infected with bacteria and toxins. These flowers were either made with a poultice or infused into oil for application on wounds. The infused oil or cream of marigold flowers is used extensively in aromatherapy to treat eczema, scars, cracked skin, rashes, inflammation and viral infections. The petals of this summer flower are used to make an eye wash. Both homoeopathy and conventional medicine utilize marigold as a healing ointment for cuts and grazes. The Calendula or marigold has antiseptic, stimulant and anti fungal properties. The flower marigold can be made into a tea or infusion to aid in the healing of irritating and painful mouth ulcers, colitis and stomach ulcers. This works by stimulating the lymphatic system and by reducing swelling and cleansing pf toxins in the body. This absolutely amazing medicinal plant has forged its way into Egyptian, Indian, Greek and Roman medicine as well as into the herbal healing arenas of the Europeans. The golden orange flower blooms just once a month, lending it a religious mystique. Marigold is well known as a remedy for burns, cuts, insect bites and bruises. Applied most often as a salve, ointment or compress, it speeds up the healing process, alleviating inflammation, pain and probable infection. When applied as a salve on women receiving radiation treatment for breast cancer, it has been proven to reduce the dermatitis that usually follows chemotherapy treatment. Apart from the marigold being antimicrobial and anti inflammatory, it is an excellent emmenagogue, aiding in regulating and balancing the painful and irregular menstrual cycles. It is excellent in the treatment of gastro intestinal problems as well: for instance, for stomach ulcers, gall bladder disease, and indigestion and even helps to prevent stomach cancer. Marigold is regarded as a cholagogue, protecting the stomach and intestinal lining by inhibiting prostaglandin which may lead to inflammation and swelling. These flowers have a number of antioxidant components such as carotenoids, quercitin, volatile oils, and saponin and mucilage. It is very easy to make a marigold salve with its fresh petals. Take to ounces of freshly picked marigold petals and seven ounces of melted beeswax and bring it to a boil. Allow it to simmer on low heat for ten minutes and stir continually. Pour the liquid through the fine gauze and make sure to extract every drop of liquid from the flowers. Pour the salve into glass jars, and then allow it to cool and close tightly. Your marigold salve is ready! The marigold is just great for treating warts, corn and calluses. Marigold tea is wonderful for curing a host of ailments like inflammation of the intestines, diarrhea, liver problems, herpes, glandular swellings, hepatitis and also to deworm every month. In fact it is very easy to make marigold tea. Just boil water and then add one tablespoon of marigold flower petals to the pot of tea and allow steeping. This tea is an excellent blood purifier, and hence advisable to drink marigold tea regularly. A mixture of this marigold tea and horse tail in equal proportions helps in the treatment of cancer, tumor growths, cracked feet and ulcerated legs. Sitz baths are an old but effective way of treatment for a lot of issues ranging from healing the wounds of stitches after childbirth to vaginal infections, herpes, bladder infections and hemorrhoids. Just immerse one to two cups of dried or fresh marigold flowers in a tub of cold water for a day. Heat the flowers to just-before-boiling temperature and add them to the warm bath that is being run. Relax and sit up to your hips in this bath as long as possible. This will help to heal as well as soothe your sagging spirits. Marigold juice is another great way to cure warts and scabies. To prepare this juice, use both flowers and stem. Wash and prepare a juice out of them as usual and since it is a strong concoction, add it to carrot or apple juice to make it palatable. 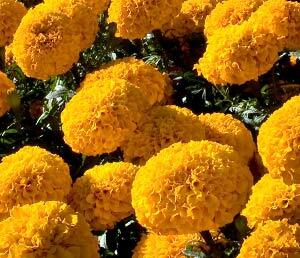 Here’s an easy way to make an ointment of marigold flowers. Chop the fresh flowers and add it to coconut oil. This is good for healing athlete’s foot, nose scabs, varicose veins and skin infections. If it is tincture that you are looking for, place some flowers of marigold in vinegar or alcohol and let it remain in the sun for around twenty days. At the end of this period, drain out the vinegar or alcohol from the flowers and your marigold tincture is ready to use. This is excellent for regulating menstrual periods and in the treatment of anemia. An infusion (and a cold one at that) made with marigold flowers, is just the right thing for relieving tired eyes. A cold infusion is nothing but tea that is left to cool and placed in the refrigerator. Dip a cotton pad in this infusion and place it on the eyes. It is so very soothing.